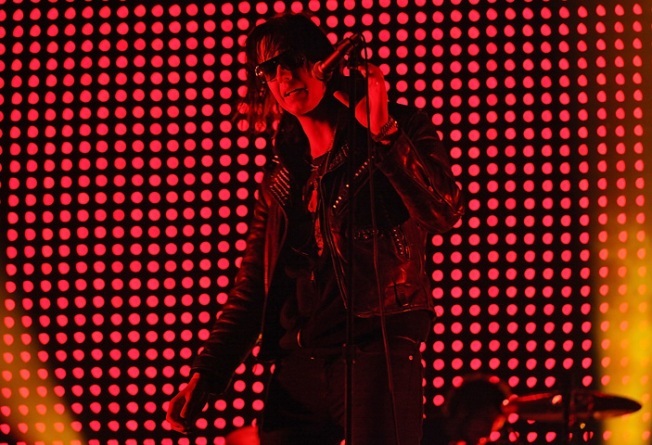 Friday night's other headliner, The Strokes, perform. Ludlows Street’s favorite erstwhile sons the Strokes have firmed up some more details on their new album. They were a long time coming. "We're all really excited to be stepping into the next chapter. We spent the last six months recording in my studio upstate and we are beyond thrilled with the 10 songs we have for this record." Borderline relevant side note: this month produced the third time this year that this reporter has witnessed Strokes singer Julian Casablancas, the famed Lower East Side scion, wandering the below-14th grid of Manhattan with the bewildered look of a lost tourist. The first time, he was standing on the busiest corner of Soho, dragging a suitcase and staring up dazedly at the street signs.